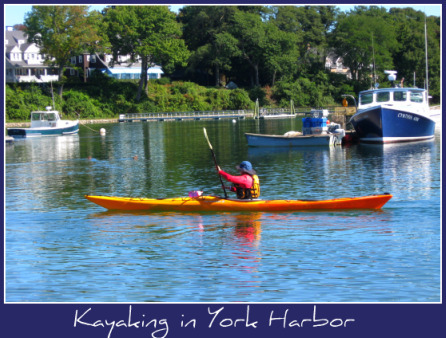 York Harbor, Maine – A Quiet Place With A Lot Of Action! York Harbor, Maine is stunning. No doubt about it. I stood on the Lilac Lane bridge to take this picture of the causeway that leads to the Wiggley Bridge, one of the world's smallest suspension bridges, and I just looked for awhile, marveling at how pretty it is. I've walked that causeway into the woods on the loop path that brings you back to the bridge a hundred times, in rain, snow, sun and once after a days-long rainstorm that left the water level spilling over the top of the causeway. 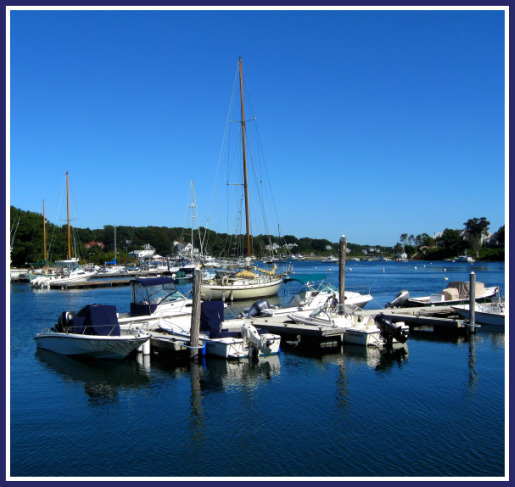 The “feel” of York Harbor is serene, graceful, beautiful. Yet when I spent part of an afternoon wandering around, taking pictures and getting inspired to write this page, I realized that it's actually very active in this part of York. Kayak rentals are available from Excursions, which is based at Dixon's Campground in Cape Neddick. Guided tours for all ages and abilities are also available. Phone: 1-207-363-0181. 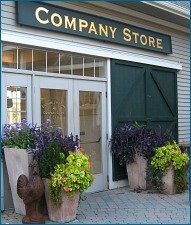 Email: info@excursionsinmaine.com. Harbor Adventures offers sea kayak and bike adventures along the coast of Maine. Check out the full moon paddle! Phone: 1-207-363-8466. Email: harboradventures@aol.com. If you have your own kayak, launching couldn't be easier at Town Dock #2 on Harris Island Road. From there, you can either kayak up the York River past the Wiggley Bridge, or paddle downriver to the Atlantic ocean. A Little Maine Fishing and Boating, Anyone? 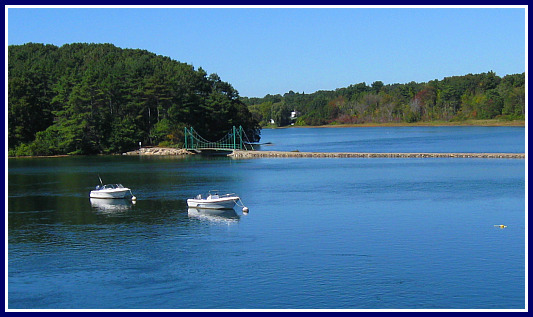 York Harbor is also the hub of boating in York. It's right here that you'll find boating supplies at York Harbor Marine Services on Harris Island. They also have sales, service, dockage, fuel and most other marine supplies. Of course, if there's anything you need to know about boating in the waters around here, they'll tell you. York Harbor Marine Services - Phone: 1-866-380-3602. Email: office@yorkharbormarine.com. 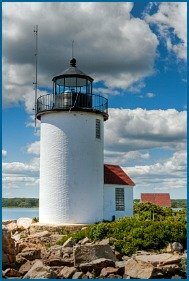 If you don't have a boat but you want to get out on the water, York has some excellent choices for both scenic cruises and deep sea fishing in Maine. Bigger 'n Better Sportfishing Charter Boat (Captain Michael Sosik): Boat can be chartered for ground fishing, shark fishing, tuna fishing. For the non-fisherman, scenic, romantic, lighthouse, and whale-watching trips are available. 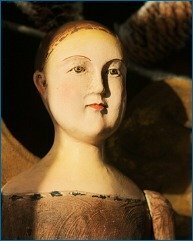 A requiem cruise provides a discreet, respectful, private setting for families or friends to fulfill the final request of a departed loved one. Phone: 1-800-526-8172 or 1-774-200-3020 (cell phone). Email: mfsosik@nemerchant.com. Shearwater Charters (Captain Bill Coite): Fish the York river and shorelines from Kittery to Ogunquit for striped bass, mackerel and bluefish, or the offshore waters for school bluefin tuna. Phone: 1-207-363-5324. Rip Tide Charters (Captain Dave Guerard): Rip Tide Charters, offers fly-fishing, light spinning tackle and live bait fishing for striped bass, bluefish and mackerel. Phone: 1-207-337-3608. Email: captdave@mainestriperfishing.com. 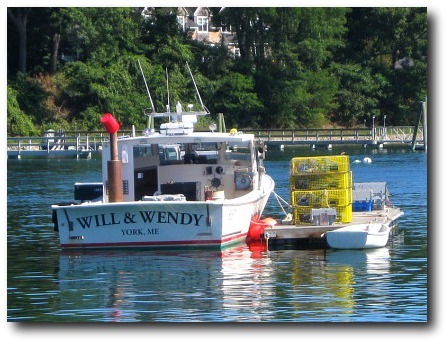 Fish with us from mid May thru October, from the Merrimack River in the Newburyport, MA to the Saco River in Saco, ME. And if you really love fishing and like to get your game on, get yourself to the annual Dockside Striper Tournament, usually held in late June. The Dockside Guest Quarters is a lovely inn out on Harris Island in the harbor and they've been sponsoring a large striper tourney for the last three years. 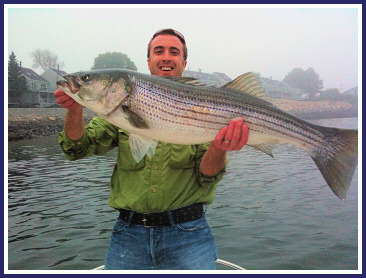 The Dockside Striper Tournament was expanded in 2009 to include three additional days and fishing categories (Bluefish, Cod and Mackerel). The Striper category was catch and release, but the daily weigh-ins of the other fish brought high-fives, smiles, oohs and aahs. So go down to York Harbor, grab a rod, and catch a cod (sorry – couldn't resist)! York Harbor is the perfect place to take a walk, which is why you find me walking there so often, I guess! And my husband, who is a runner, almost always chooses a running route that passes through the Harbor. Wiggley Bridge Walk – Park on Lilac Lane (Route 103) in the public parking spaces across the street from the causeway leading out to the Wiggley Bridge. Walk the causeway across the Wiggley Bridge, into the woods. Take either the left hand or right hand path, they both lead back to the Wiggley Bridge if you walk in a big circle. Fisherman's Walk – Park on Lilac Lane (Route 103) in the public parking spaces across the street from the causeway leading to the Wiggley Bridge. The Fisherman's Walk begins as a footpath on the same side as and adjacent to the parking spaces. 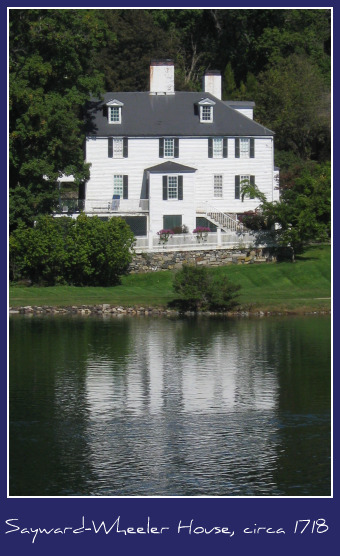 The footpath proceeds towards the river and travels right in front of the circa 1718 Sayward Wheeler house. You can walk along the boat-filled York river, always keeping the river on your right, until you come to the grounds of the Stage Neck Inn with the tennis courts directly in front of you. If you like, continue straight on to the beach and pick up the Cliff Walk on the left as you face the ocean from the beach. Cliff Walk – If you have a resident parking sticker, park at Harbor Beach off of Route 1A. Otherwise, park across the street from the York Harbor Inn on Route 1A and cut through the park down to the beach. The Cliff Walk is rugged, and sometimes the ocean and elements have their way and parts of the walk are worn away, but the town does its best to keep it in good repair. Keep to the path, because the Cliff Walk is only open due to the generosity of those who own the oceanfront properties and grant access for all to enjoy. York Harbor Inn to Long Sands Beach Walk - Park across the street from the Inn at 480 York Street. Hop out (free 2 hour parking) and walk north on Route 1A till you get to York Beach (you'll know you're there because there's this big blue ocean on your right). ...lunch and dinner options in York Harbor are both varied and really, really good. The Dockside Guest Quarters on Harris Island also has a fine restaurant open to the public and right on the water. More public dining choices include Stage Neck Inn (especially the Sunday brunch! ), which is perched on the rocks right where the York river meets the Atlantic Ocean, Chapman Cottage B & B, which has dining Wednesday through Sunday in season, and boasts a wine/martini/tapas bar, and Foster's Clambakes. Foster's is unique in that they have been hosting traditional Maine clambakes for decades. 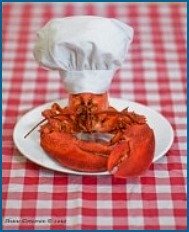 It's also a great place for a catered Maine clambake – rehearsal dinner, reception, family reunion, 50th anniversary, you name it. They can fit over 400 people in their Pavilion, or they'll come to you - even in winter. 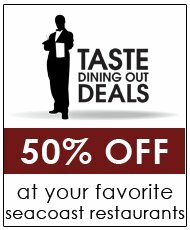 But if just two of you want to go and have some good down home Maine cooking at Foster's, they're there for you too! Stage Neck Inn: 8 Stage Neck Road (use 67 Stage Neck Road for online mapping purposes) Phone: 1-800-340-1130 or 1-207-363-3850. Email: reserve@stageneck.com. Chapman Cottage B&B – 370 York Street (Coastal Route 1A), York Harbor, ME 03911. Phone: 1-877-363-2059 or 1-207-363-2059. Email: info@chapmancottagebandb.com. 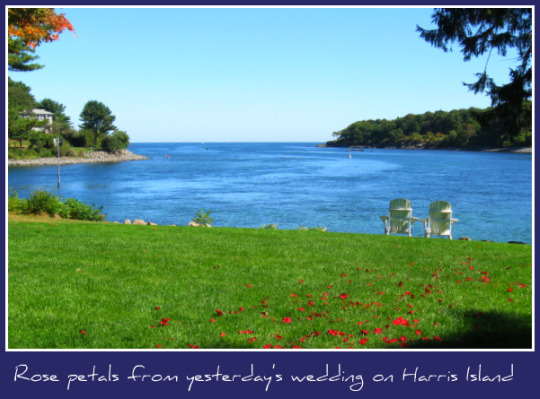 Edward's Harborside Inn B&B - P.O. Box 866, Stage Neck Road, York Harbor, ME 03911. Phone: 1- 207-363-3037 or 1-800-273-2686 (Reservations ). Email: yorkharbor@aol.com. Inn at Tanglewood Hall B&B - 611 York Street York, Maine 03909. Phone: 1-207-351-1075. Email: tanglewood@maine.rr.com. Morning Glory Inn B&B - 120 Seabury Road York, Maine 03909. Phone: 1-207-363-2062. Email: morningglory@maine.rr.com. Inn at Harmon Park B&B - 415 York Street, York Harbor, ME 03911. Phone: 1-207-363-2031. Email: santal@maine.rr.com.